Google is working to change this and is providing increased access in remote areas by using thousands of female trainers across India. The trainers get around the region by riding bicycles; each bike has a box full of tablets and smartphones for women to try, and to train on. The goal is simple – provide people with the tools and understanding of how being connected could benefit their lives. In rural India, only one in 10 women currently use the Internet. Many women are kept from using the Internet due to economic and cultural barriers. In a country of 1.2 billion people, nearly 1 billion still do not have access to basic Web services. 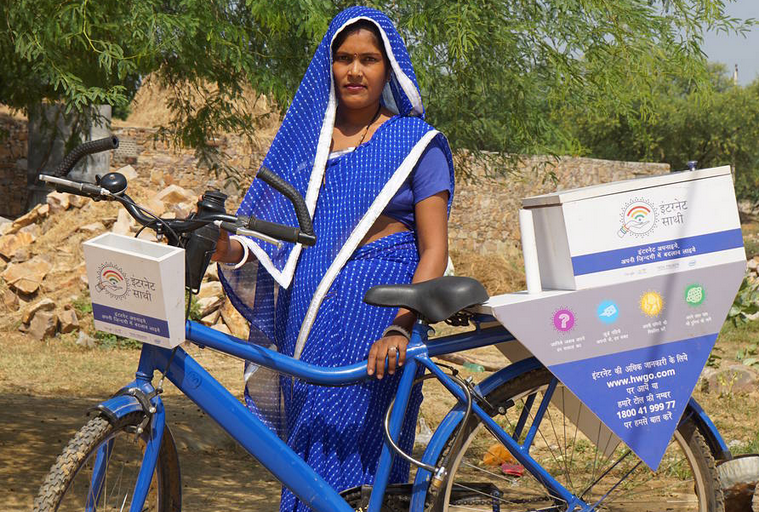 Google partnered with a local philanthropy, Tata Trusts, in the project named “Internet Saathi,” to show women in rural India how to connect to the Web. Instructors are trained on how the Web works, then are given bicycles with equipped with devices running the Android mobile operating system. The project has already trained 9,000 guides, who have helped reach more than 1.5 million women in 12 states in rural India. Have students list everything they do on the Internet in an average day. Now ask students to imagine that they do not have that easy access. Divide students into teams. Have each team describe examples of how poorer and remote people might benefit from accessing the Internet. In teams, have students develop other ways in which Google or other companies could provide services to remote villages and poorer residents.